I have a .NET 4.0 C# solution with a tests project which runs unit tests under NUnit. The NUnit binaries are v3.5. I can run the tests perfectly well but can't set breakpoints and single step in visual studio. I'm guessing this is caused by the mis-match in .NET versions. Is there any way to single step through a v4.0 tests assembly using nunit for v3.5? The problem is that unless you tell it otherwise, NUnit will spawn a subprocess to run tests when it determines it necessary. If you watch it in Process Explorer, you can see that "nunit-console.exe"* spawns "nunit-agent.exe"*. The Visual Studio debugger doesn't automatically attach to child processes. Once you change that, the first NUnit process will already be .NET 4.0 and it shouldn't need to spawn a sub-process. If you want to be sure, specify /process=Single and NUnit will either run in a single process or fail immediately if it cannot. In case it is helpful to someone I know this is 4 years old but I followed the answers here and they were useful. Even though my answer is for another entire version of NUnit however for somebody like me that is just discovering this I installed NUnit and NUnit Console via Manage NuGet Packages... (1st and 3rd option in the screen shot) and so configured my test project properties Debug tab (see next screen shot below) in VS2015 Community edition to run nunit3-console.exe which is found off your \packages folder that is automatically created when you install "NUnit Console" and for the arguments I added my test library dll and the commandline switches --wait (which prompts the developer to "Press any Key to Close" so allows you see the result), and more importantly --inprocess that attaches your test library .NET code automatically so your break points are hit. Note to run the NUnit3 console app you set your test project as the start up project. Another option is to use http://testdriven.net/ to run your tests through Visual Studio, you can put a breakpoint on a test & right click -> run tests -> with debugger. Resharper allows you to step through your Unit tests while debugging. But I dont think you can do the same with Visual Studio. Try installing the trial version of Resharper and then try to debug the tests. I'm note sure about the console application, but you should find you can start the GUI version of NUnit manually and then attach to the nunit-agent process from the debugger in Visual Studio. Not the answer you're looking for? Browse other questions tagged c# nunit or ask your own question. What is the best way to debug a NUnit test? 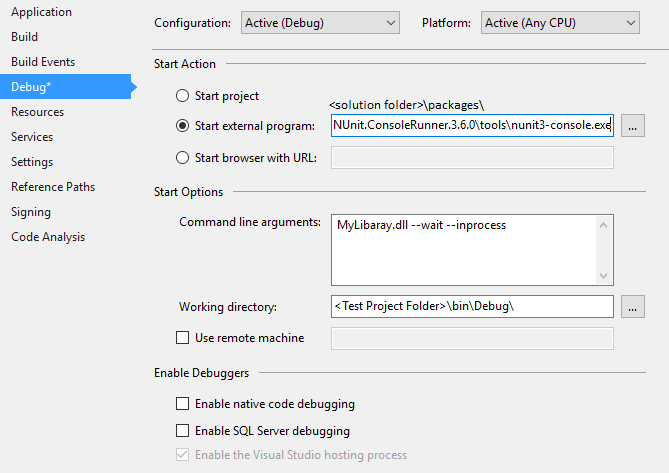 How do I run NUnit in debug mode from Visual Studio? Does C# 6.0 work for .NET 4.0?